I am often asked if I use actual locations for my Flora Maguire Mysteries, and the answer is - definitely. which once existed, those which can still be seen today or have been wiped away in the name of progress. Here are some of the places Flora goes in her search for clues and to expose murderers. 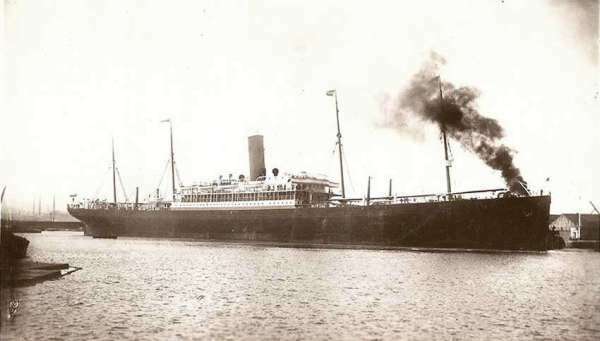 The introduction to the Flora Maguire Mysteries began on the steamship which left New York on test run with under a hundred First Class passengers before the actual maiden voyage which left from London a few weeks later. The ship was a mini-Titanic, and according to the promotional material of the times was just as luxurious, with a glass roofed dining room, electric lighting, and a beautifully appointed library. It was also one of the first ships to carry wireless telegraphy. Cleeve Abbey is an imaginary estate outside Cheltenham, Gloucestershire in the summer of 1902 when the town was celebrating the coronation of King Edward VII. 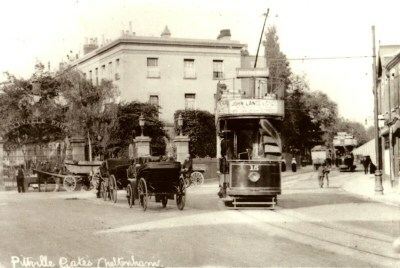 Cheltenham had a tram system and the entrance to Pittville Park was a penny. She also seeks advice from a pharmacist in Montpellier. The building is now a wine bar. Flora investigates a murder where the body of a young woman is discovered outside a public house in Knightsbridge. Located in a alley called Old Barrack Yard just off the main road where an 18th Century army barracks once existed. 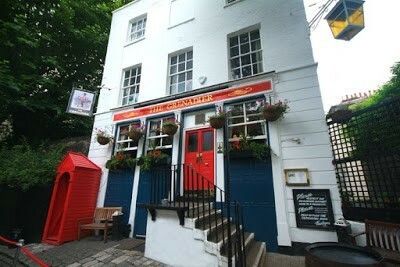 Built in 1720 the inn was known as the Duke of Wellington's Officers Mess and was also frequented by King George IV. It also houses a famous ghost called 'Cedric' who was reputedly beaten to death by his fellow offers for cheating at cards. I couldn't resist including in the story. 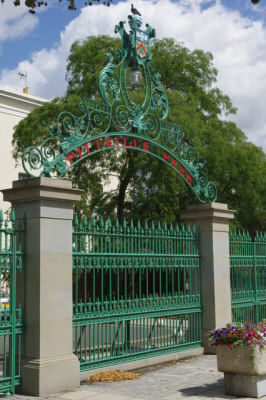 Opening in 1869 in Quilp Street, founded by Baron Ferdinand de Rothschild in memory of his wife, Evelina de Rothschild who died in childbirth after only one year of marriage. Rothschild wanted to open a maternity hospital, but was persuaded by his friend Dr Arthur Farre, a famous obstetrician and physician to the Queen, to open a children’s hospital for the poor. In the early days, patients with infectious fevers and children under two years old were not permitted; rules which were repeatedly ignored by doctors and eventually overturned. By 1900, over 50% of admissions were babies and toddlers. The Tower Subway runs between Tower Hill on the north bank of the Thames, through to Vine Lane on the south bank just west of Tower Bridge. A cable car with12 passengers at a time was pulled on a track from one side to the other in 70 seconds. Due to a series of technical mishaps and a lack of custom, the shuttle service stopped after three months and the company went into receivership. The tunnel was turned into a pedestrian walkway, with the cable car and passenger lifts being replaced by gas lights and spiral staircases. 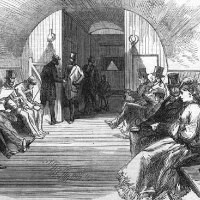 20,000 people a week braved the dark, dank and claustrophobic tunnel beneath the river at a cost of a halfpenny each way. In 1894 Tower Bridge opened making the subway redundant when crossing the new bridge was free. The tunnel was closed to the public. Built in 1771-76 for Sir Pensiton Lamb, 1st Viscount Melbourne, the father of William Lamb, Lord Melbourne. Like most aristocratic house builders of the time his ego extended beyond his resources and he was forced to sell it to Prince Frederick, Duke of York and Albany, the second son of King George III. 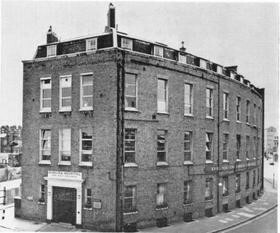 In 1802 the Duke gave up the house and it was converted by Henry Holland into 69 bachelor apartments (known as "sets"). Designed with a strict set of rules, one included that residents, or members should not disclose the names of others who lived there, thus Arnold Baines' dilemma when Flora asks about Colonel Hunter-Griggs.